As legend has it, Abraham Lincoln walked three miles through the snow to return a book because it was the honorable thing to do. That's nothing. I drove 164 miles through Texas in a 2009 Volkswagen Tiguan S to return a book because I've got a bad history of losing my best friend's books. I once loaned one to someone who took it to Spain and then loaned it to someone else who took it to San Francisco. I systematically destroyed another one with notes, dog-earing and misuse. Another one just disappeared altogether. I was on the verge of forever losing borrowing privileges from my few remaining friends. What else could I do? I headed towards Austin. 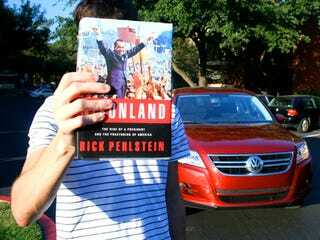 The book in question, Nixonland by Rick Perlstein, was rather appropriate for the trip I was making. It discusses how Richard Nixon managed to take us from a country that overwhelmingly elected Lyndon Johnson and his Great Society to one that overwhelmingly elected Nixon and his secretive society. I say appropriate because Austin, my destination, is full of the kind of liberal McGovernites that Nixon used to divide the country to his advantage. Volkswagen has always been the brand of liberals [well, post Hitler – Ed.]. From the Volkswagen Beetles of the free love generation to the Passat station wagons of the yuppie crowd, if you see that VeeDub logo on the front you're more likely to see a "visualize world peace" sticker than a "Newt in 2012" one. But the genius of Nixon wasn't that he divided the world into liberals and conservatives or Republicans and Democrats, it was that he split society into the elites and everyone else. Perlstein focuses on an undergraduate election at the Whittier College, where Nixon won the election for president of the student body by taking on the campus elite, represented by an organization called The Franklins. Nixon formed his own group, The Orthogonian Society, made up of everyone else. He won by a large margin. Driving from Houston to Austin I had plenty of time to consider whether the Tiguan, in a compact crossover segment that's becoming increasingly crowded, is an Orthigonian everyman like the Ford Escape or in the more elite company of the Infiniti EX35. Who would drive the Tiguan? Richard Nixon or John Lindsey? On the open road the torquey turbo four, shared with just about every other VW product, has a distinctly European feel to it. The quick response and ample torque across the rev range suggests good breeding and a life spent at boarding schools. Think Phillips Exeter Academy or Georgetown Prep. I hoped, while passing through Bastrop County, a notoriously Orthogonian area, that no one would notice the Franklinesque nature of the powertrain. Pulling into Austin I predictably hit traffic and decide to carve my way through some hilly backstreets on the way to my friend's house. Here's where the Tiguan finds a more common attitude. It's a familiar ride to anyone who has driven a car in this segment. Not overly soft or abrasive. Not exciting but not disappointing. Though it shares a platform with the Golf/Rabbit/GTI family you'd be forgiven for not realizing it around turns as this crossover is a victim of its size and (car) class. It's height adding lean and vagueness, but its size retaining enough of the Golf's nimbleness to ensure it never feels totally out of its element around bends. Orthogonions would approve. When I finally caught up with Dan he inspected the book and was satisfied to see that it was in almost perfect condition. It was time to repair to dinner so, along with his girlfriend, we hopped into the Tiguan. Dan, like many Austinites, drives a Volkswagen Golf when not using public transportation and is therefore familiar with the automaker's appointments. He liked it. Even in the basest of trims the Volkswagen stands above its non-luxury competitors - the Ford Escape and Saturn Vue - in terms of design, material and feel. The Tiguan's interior is light, airy, uncluttered and made from high quality materials; no cheap plastics or undamped switchgear in here. It's big too, the body's added height adding a roominess the Golf it's based on is totally lacking. A point for the Franklins. I point out the folding seats and rather simple radio as a way of racking up more points for the common set, hoping to get the kind of even balance that makes these kinds of comparisons more relevant, but it doesn't quite work. Driving around in a German CUV, even one that isn't particularly luxurious, is still driving around in a European car. An impoverished Duke is still a Duke. In the end, the Tiguan ends up being not common enough to be an Orthogonian though not quite luxurious and well bred enough to be a true Franklin. We'll call it a Franklin anyways. As Nixon became more paranoid just about everyone who wasn't completely in support of his presidency became lumped in with the Franklins and, were he to know that we were on our way to a place that served gourmet cafeteria food, he'd probably consider us Franklins too.